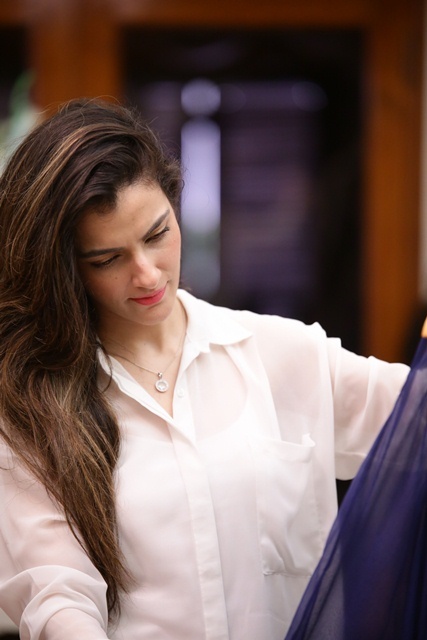 Acclaimed fashion designer Zainab Chottani is all set to launch her Spring/Summer 2016 Collection across Pakistan, with the prestigious Lakhany Silk Mills (LSM Fabrics). 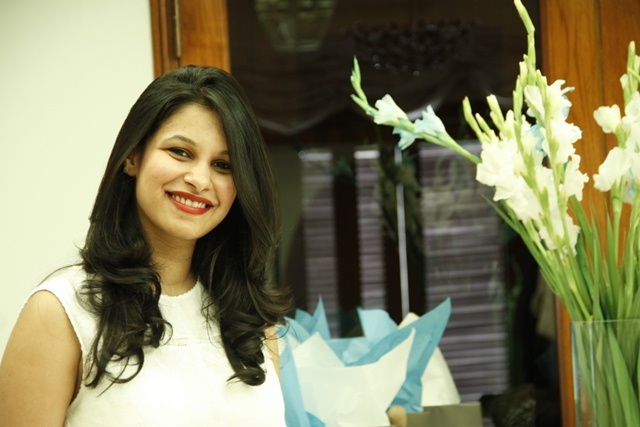 This is the second year of Zainab Chottani’s collaboration with Lakhany Silk Mills. The Collection featuring 10 designs in two colors each, is premium quality jacquard and cotton lawn with pure silk and chiffon dupattas in each outfit, along with intricate embroidery and embellishments to complete the ensemble. The preview was attended by Karachi socialites and personalities from the media and fashion fraternity including TV personalities like Ayesha Omar, Aisha Khan, Sanam Jung, Sanam Baloch, Sarwat Gillani, Zhalay Sarhadi, Hasan Rizvi, socialites, Lal Majid, Nighat Misbah, Wajid Khan, Nazneen Tariq, designers Nomi Ansari, Wardha Saleem, Umer Sayeed, Mahin Hussain and models Iman Ali, Areeba Habib, Fia Khan, Omer Shahzad, Sadaf Kanwal, along with many renowned names from the industry. 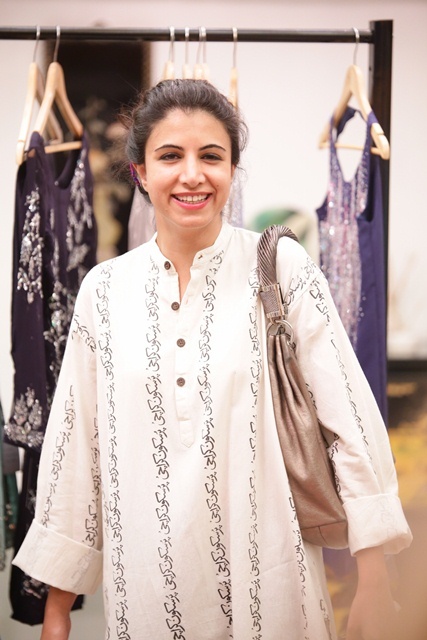 “It is the second year of my collaboration with Lakhany Silk Mills, and the partnership works because we share the same brand ethos and values as LSM.” remarked the designer Zainab Chottani about working with the textile giant. “Keeping the latest trends and our weather in mind, we have designed the Collection in such a way that Pakistani women from all walks of life can wear it on a host of events & occasions – be it casual, professional or social.” Chottani further added about the Collection. Zainab Chottani Collection by LSM Fabrics will be available at all leading outlets and online on http://www.lsmfabrics.com/ from 17th March 2016 within the price range of Rs. 5,850 to Rs. 6,350. Pakistan’s pre-eminent couturier Nilofer Shahid will be presenting her “Rembrandt Collection” as the grand finale to Fashion Pakistan Week [FPW15], Winter / Festive 2015 on Monday, 30th November 2015. Nilofer Shahid’s creative obsession with the great Dutch artist Rembrandt began six years ago during a visit to the Rijks Museum, Amsterdam, when she was spellbound by the sheer genius of Rembrandt. 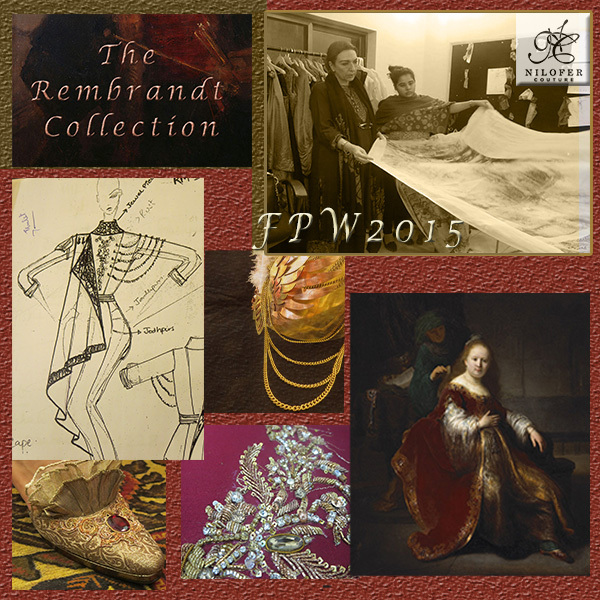 The Rembrandt Collection is the realization of that grand obsession into sartorial expression. Rembrandt has captivated the imagination of millions over the centuries, but no one in the East has paid tribute to his work in the form of couture. Nilofer’s Rembrandt Collection is in many ways a conversation between the two artists and a powerful expression of her fascination with the Master. The collection is based on the Life & Works of the Maestro. The Five Segments of the Collection depict unique stages of Rembrandt’s life and artistic career: Etching; Chiaroscuro (light and shadow); Baroque; Military; Melancholy. 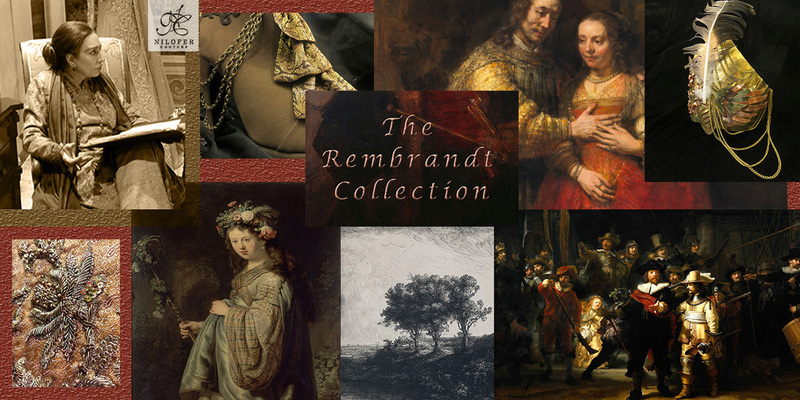 Garments in each category reflect some of Rembrandt’s most celebrated paintings. 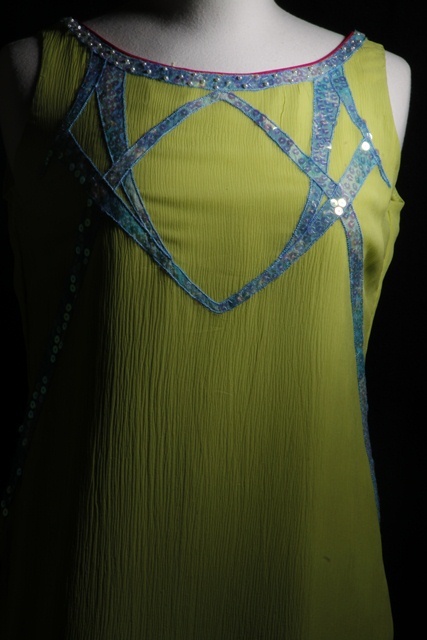 Every dress is a story, treated in layers, never drifting from its artistic dialogue; each dress is a tribute to the artist’s devotion and creativity. The showstopper is inspired by one of Rembrandt’s most famous romantic paintings, “The Jewish Bride,”- a work of awesome solemnity that represents a deep fusion of spiritual and physical love, unsurpassed in the history of painting. The collection uses a variety of luxurious fabrics including Velvet, Cashmere, Kimkhwab (our local hand-woven brocade), Jamavar, Duchess Satin, Chantilly lace, Organza and various silks. 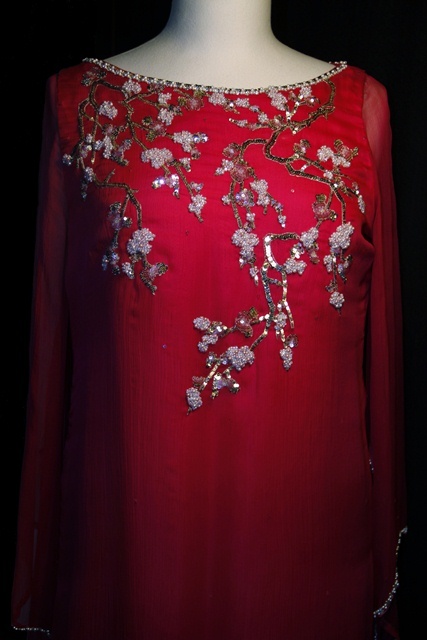 Nilofer has employed a combination of modern and traditional techniques including digital-printing, laser-cutting, zardozi, resham and stonework in her Baroque embellishments. 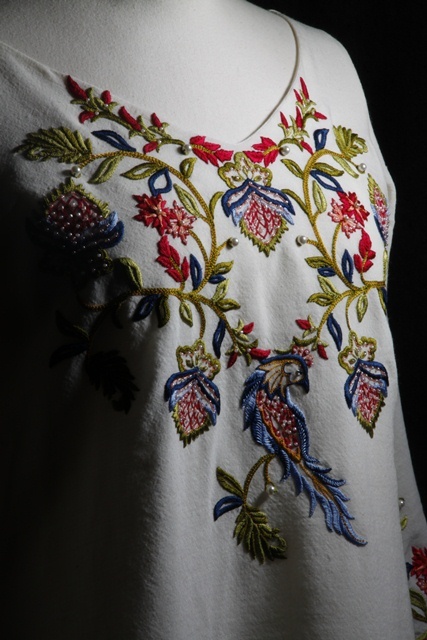 She has used semi-precious stones and pearls to accentuate 3-D embroidery and has developed a unique chainmail effect. Nilofer’s couture roots are reflected in the emphasis on structure and impeccable detailing. All of the accessories for the collection have been created in-house, including shoes, bags, jewellery and headpieces. Watch for copper accents throughout, including copper heels, armbands and earcuffs, inspired by the copper plates Rembrandt’s used for etching. Baroque accents including plumes, pearls and genuine semi-precious stones evoke seventeenth century opulence. “He touches the core of my soul, when he bares his. He always abandoned convention, like I do.